A lot of people see the price of Shakeology and say “oh, that’s too expensive!” But it’s really not when you break it all down and see all of the benefits it brings. Shakeology costs $119.95. That breaks down to $4 a day for a full meal as a customer, and $3 a day as a coach. You can’t even get a $5 footlong, or a salad for that price! And a lot of people spend a lot of $ on things like a Starbucks coffee and that is EXPENSIVE! 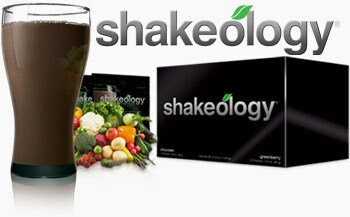 There are ways to make Shakeology so that it tastes like one of those dessert coffees at Starbucks. But guess what? Making it with Shakeology, makes it HEALTHY! Plus, I have been able to stop taking multivitamins and other supplements because Shakeology is FULL of vitamins and nutrients that have totally replaced those. I don’t need my digestive enzymes, my whey protein, my multivitamins, or probiotics – it’s all in there! If you were to buy a one month supply of all of the stuff that goes into Shakeology, it would cost $250 or more. It’s so convenient to get what you need for the day in one simple shake. Option 1: As a customer, set it up as Auto Ship. When you do this, you don’t pay shipping. So that saves you about $9-10 per month – SWEET! There’s no time commitment for monthly autoship, and if you’re not happy after 30 days, there’s a 30 day bottom of the bag guarantee. Yep, it’s true – you can finish the whole bag and if you’re not satisfied, get your $ back. But you will be – it’s amazing. Signing up for autoship for 1 year saves you about $100-120 on shipping costs! Option 2: As a customer, become a Beachbody club member. With a club membership, you can save 10% on your Shakeology. The club membership costs about $39/quarter, and it comes with a lot of cool features like a personalized nutrition plan, 10% off your purchases, cash prizes for working out, and VIP access to celebrity trainers! This is a great option if you’re interested in a personalized meal plan, buy other things like vitamins, recovery formula, or P90X One on One monthly DVDS, or if you live outside of the US! Option 3: The biggest cost savings is to become a Beachbody coach yourself. You can become a coach just for the discount, or we can work together to build your business for some extra income. As a coach, you save 25% a month on your Shakeology! That’s $30 you save!! So here’s how it works. Initially, you pay a $39.95 fee to sign up as a coach. Every month after that, you pay a fee of $14.95. This fee is basically to keep your websites up and all that stuff so you don’t have to worry about that. So here’s the net savings per month. Per year, that’s $300.60 you save as a coach! So, there it is! I just wanted to share some options to save $ with Shakeology. If you want a sample, or you have any questions about the product, coaching, or memberships, email me at joline.atkins@gmail.com. Do you have any plans for March? Wanna climb a mountain with me for 90 days? A number of people who accepted my last challenge are currently entering days 60-90. At the end of those 90 days, the numbers will be tallied. The "before" and "after" pictures will be viewed. Prizes will be awarded. Success will be CELEBRATED! As we enter the last month of that challenge, I thought it only right to begin a new pre-summer challenge. You may have felt a "doh" has you read my mountain post last week. If you did, I'm asking you, directly, to "head north". You will not ascend the mountain unprepared or alone. There will be no "hasty" means of weight loss. You will follow a well-developed, proven, and critically-acclaimed program by the good folks at Beachbody. For all of us are committed to helping "End the Trend" of obesity in our country. Here's the scoop. And, before you read further, yes, it will be an investment. There is the option of getting both your program and Shakeology at 25% off by becoming a Coach with Team Beachbody. Don't immediately rule this out. I became a Coach very shortly after taking my "before" picture. Coaching served as an extra motivation for me. Some contest, right? Maybe you're thinking, "WAIT! I don't just fill out my name on some card and hope my name is called?" I am asking you to do NOTHING LESS than what I did to make a change in my life. I'm not going to carry you up the mountain. I will, however, scale it with you. 'You have circled this mountain long enough. Now turn north'. " You may not be one for Bible passages, but I am. This verse is a golden nugget. A chunky morsel. Many of us continue doing the same activity over and over, while hoping and expecting different results. This "plan" only results in frustration, for using the same method over and over again when attempting to solve an ongoing problem or make a life change, will only prove ineffective. What mountain are you currently circling? Is it a desire to lose weight? Mend a relationship? Start a new business or create a plan to work towards a dream goal? Perhaps pay off debt? Maybe your mountain is a damaging habit, a secret/hidden activity, or a thought/lie that you often tell yourself. Do you look up at that mountain and immediately believe that climbing it is insurmountable? Do you fear any attempts to scale your personal mountain, choosing defeat before even suiting up? The mountain IS high. Scaling it WILL be taxing. Climbing it WILL take a concentrated effort. The process will NOT be quick and should be well planned and thought out. "Hasty climbers make sudden falls." There will be hurdles, mis-steps, slips and trips, perhaps a re-route or two, and the need for physical and mental fortitude. You will need a map. And supplies. Tools for the journey. Plus, a smart climber would never ascend the mountain without first telling others what he or she intends to do and where they intend on climbing. The importance of safety and accountability shouldn't be discounted or seen as weak. Inevitably, though, if you keep climbing? So,what's your first step? Well, that's an easy answer, but not an easy action. As Seth Godin so simply states, "You don't need more time. You just need to decide." I've not been shy about sharing my difficulty with the chin-ups and pull-ups in P90X. I'm on week six, and while I have barely eeked out one unassisted rep of these nasty rascals, I have definitely increased my reps with the use of a chair. 1. It shines a spotlight on the fact that I've yet to conquer this nemesis. 2. I wind up wasting valuable workout time when I stop due to my inability to keep up with the elite on screen. I desire to use my time well. While resistance bands don't provide as much of a challenge that even a chair-assisted pull-up and chin-up do, they DO provide me with consistent repetition for a good 15 pulls. This, in turn, builds my strength. So, today, I experimented by only using resistance bands. The result? Way more heavy breathing. By using the bands, I decreased the amount of time between exercises, which kept my heart-rate up. While I do need to pick up a dreaded "green band" from my Beachbody site, I still got a good workout today with my red one - choosing to sit on the floor to create the most resistance I could for each exercise. By going this route, I didn't experience the psychological let down of dropping from the bar while still having a minute to spare. I'm going to stay with this course of action until the third month, at which time I'll attempt the bar once again. As for Ab Ripper X? I can now do 25 V-Up Roll-Ups. When did that happen? And a word for a few, um, well-meaning peeps who have mentioned that I am, ahem, obsessive when it comes to exercise. Really? I know you mean well. Frankly, I don't think 30-60 minutes of exercise 5 or 6 days a week is obsessive. I also brush my teeth everyday. Ever heard the saying, "Only brush the teeth you wish to keep"? Think about it. Thanks for your input. I'm going to keep my teeth. And my muscles. Not the Slimfast - you know better than that. And I don't pay $120 for it. I'm a Beachbody Coach, silly. The general public craves weight loss miracles claiming "fast", "easy", and "quick" results - without effort, planning, or sweat and good 'ole hard work. By now you should realize there is no magic pill. Shakeology does NOT promise "fast", "easy", or "quick" results. One does not replace 3 meals a day and then go along merrily only to experience the pounds miraculously melting away. Shakeology is one tool in your health and fitness toolbox. To be effective, it also requires another very important tool - GASP - exercise. The above chart shows a few general differences between our product and what you can get in your grocery store. 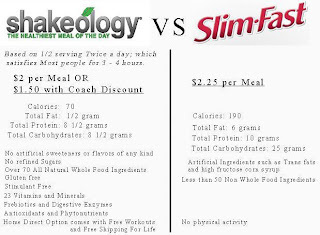 While the up front sticker shock of Shakeology can be frightful, upon comparing the Slimfast "program", one can see that more is spent in a month on a product that is sorely lacking in any nutritional value. 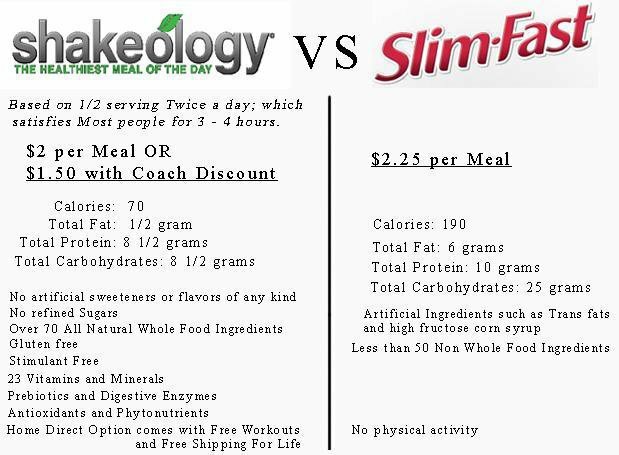 If you think $120 is a lot to pay for a month's supply of SHAKEOLOGY, (or $4.00 a day) check out the cost of Slimfast. At $2.25 per meal, x 3 meals a day = $6.75 a day, x 30 days =$202.50 a month. And you can see the added benefits of drinking SHAKEOLOGY over Slimfast. 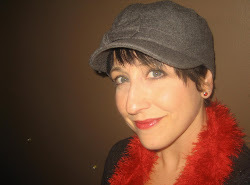 Go to www.shakewithjo.com to see what 100 doctors are saying. 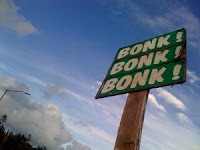 And lest you think I'm making this up, I spent some time with the owner of a locally owned health food store yesterday. After looking at the ingredients in Shakeology, he graciously led me around his store to show me what products would need to be combined to "make" a Shakeology-type product, using products he carries. "How would that taste?" was my thought - since those products weren't never meant to be combined in the first place. Oh, and the bottom line of combining those shake powders to replicate a Shakeology-type product? The wholesale price of Shakeology - a price which anyone can get by becoming a Coach. This isn't some exclusive club. Please remember that "cheap and easy" doesn't necessarily translate into being "cost effective or beneficial". Fess up. How are you trying to cut corners? Want to try Shakeology at no risk? Order Shakeology on Home Direct THIS MONTH and receive ONE of FIVE complimentary workout DVD's from me, along with FREE SHIPPING, AND 2 MORE FREE WORKOUTS, and a SHAKER CUP (with your second order), along with a 30 DAY BOTTOM OF THE BAG GUARANTEE. You may cancel Home Direct at any time, but keep the workout DVD's as my gift. Is Slimfast refunding your money when, as a friend fessed up to me yesterday, "it's not working"? New POST-illness P90X workout today. Week 5. Day 3. But, I was reminded of something very important today. I got about half-way through Back and Biceps today before my body just said, "STOP! AND FEED ME!" I was NOT hungry last week while on my sick-bed. Thus, I did NOT get in all my calories before jumping back in this week with wild abandonment. People, people, people. I know there are those of you out there that do not eat enough calories to fuel your internal furnace which in turn burns those calories. Yes, you may be losing weight, but you most definitely are not gaining muscle by doing this. Sabotage is close at hand. This chica needs to be much more focused on cooking again - like I was doing everyday before I got the sinus infection smack down. AND I need to track those calories online - like I was doing everyday before . . . well, you know the drill. As Hippocrates put it so very long ago: Our food should be our medicine and our medicine should be our food.